This month’s features – out now in newsagents or subscribe online for just $55.00 for six issues a year! Isolated and under threat, researchers in Queensland are working hard to give these charming turtles, which can be traced back to prehistory, a chance at survival. The extraordinary efforts being done are inspirational and this is a truly uplifting story. When you drive by scrubby bushland in semi-arid areas of Australia, do you ever stop to explore further? You’d be surprised by what is contained within the mallee. Simon Watharow and Steve Cook dive in among the bushes and discover a whole host of intriguing wildlife and surprising habitats. ‘Hoot, hoot’ . . . or should we say ‘who, who’? Frank Harrison set up his hide to watch and photograph a couple of Barking owls make their nest to rear some chicks. He got an amazing surprise as one by one little heads popped up out of the hollow, and his images are just stunning. Parts of the Atherton Tablelands in far north Queensland are well known, but look a little further and you’ll find incredible and diverse wildlife scattered in stunning landscapes all over the plateau. 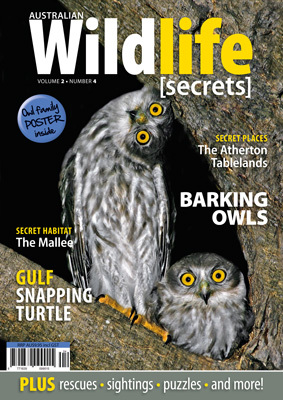 How could we go past the Barking owls by Frank Harrison for this month’s poster. Of all the colourful parrots in the world it’s hard to go past our Scarlet Honeyeater for sheer beauty, as Kathleen Davies reveals. A flash of white on the tail of a black bird is a common sight in the southwest of the country but, as Keith Hall tells us, Carnaby’s Black- Cockatoo could be a rare sight within a few decades. The O’Mahoneys have been out and about again, and this month they have captured stunning shots of an eastern Water Dragon, a Tailed emperor Butterfly and a robber fly. even we wonder how they do it. Is that a wombat stealing the car? This time Manfred bravely faces a stubborn creature that really doesn’t want to be rescued and the protests of a family dog so the owners of a car can get to work. Ceratosaurs once roamed our continent—and we know this because Museum Victoria made the astonishing discovery of the ankle bone of one of them in a seaside town in southeast Victoria. Is that a dinosaur I hear? You’ll have to head to Taronga Zoo in Sydney to hear Dinosaurs in the Wild, and you’ll love them. Do you scratch your head, look up at the ceiling or lick your pencil when you do our puzzles? Whatever it takes, enjoy.